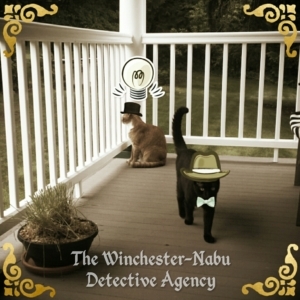 By now you’ve realized that The Winchester-Nabu Detective Agency property is located in a magical yet parallel plane accessible through a portal in New Jersey. Yes, New Jersey. What an enigma. A cauldron of conspiracies and legends from the Hookman to where Jimmy Hoffa is buried. Assuming you’ve been following the Adventures of Gus (and Oliver) from the beginning, you know that we’ve encountered evidence of supernatural activity. To phrase it more accurately, things aren’t supernatural; they’re perfectly natural and part of the world, but most humans ignore a whole bunch of it. 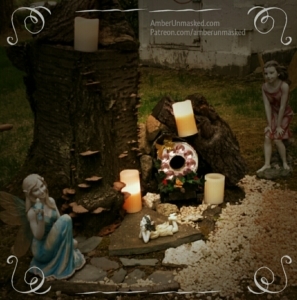 For Beltane, I was inspired to create a proper spot for the garden fae. The fairies have plenty of choices here, but there was a particular tree stump just begging to be adorned and utilized. The project came out okay. If there were funds to pour into it, I noticed some pretty sweet extras like miniature white fences, gnomes, and furniture. Our fairies were fine with what was offered which was the stump, a lovely slate patio, and a former birdhouse shaped like some kind of train tanker car thing. I covered that in jewels to sparkle and attract them and covered it up with small pieces of wood. I thoughts some chipmunks might take it over, but they never did. 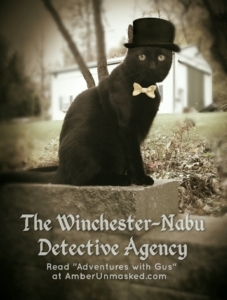 Professor Oliver Winchester does the most work keeping an eye on the fairies from his observation spot on the second floor balcony, from his private quarters which face in that direction, or from his buggy. Gus will pay a visit and give a cursory glance during his perimeter checks, but he only gets involved if there’s a reason. Sadly, one day, there was a reason. A new case file had to be opened. 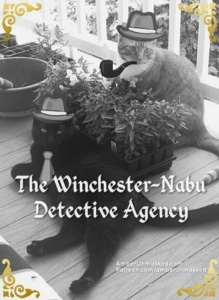 Oliver asked Detective Inspector Guster Nabu and I to check on the fairies because something seemed wrong. From where he was, Oliver noticed a change in their behavior. 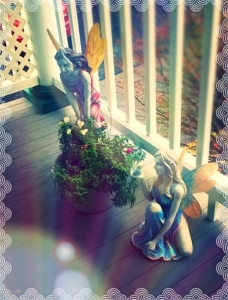 The fairies on this land are mischievous, sure, but they generally stay out of trouble. However, something has been casting a cloud over us. The assassination of Gregory Woodrow Pecker caused a stir around here. We saw the well house door wide open and the body of Meg von Fae lying on the ground nearby. She was tragically injured, but not beyond hope. I took a couple photos while Gus poked around. Meg was later taken away to see if anything could be done to save the wing. She was a trooper though. She listened to all the possibilities of an outcome. She could have requested that her remaining wing be removed also allowing her to blend in with humans and have more options for a wardrobe. But, Meg was ready to accept life with only wing. She was never about conformity. She was willing to set a course for trauma therapy at the loss of her flying ability. Fortunately, for Meg von Fae, her torn wing broke in such a way that it was able to be reattached. Then the appearance of The Stranger no longer seemed like a bloke just passing through. He came around and riled up Gus and Oliver so severely, they had the worst fight they’ve ever had. It was all because both of them wanted to go after The Stranger and took their frustrations out on each other. Cats definitely love to thrash anything with wings, so it’s likely, this fella would be a good prime suspect. 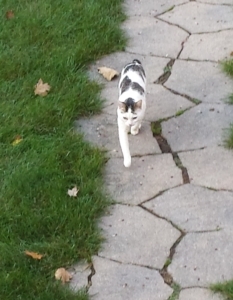 Even though cats love to chase feathered prey, the assault on Meg von Fae was unusual and could have been accidental. Cats love to knock things down for no reason at all. Oliver and Gus don’t have enough facts to rule out The Stranger’s possible habits. 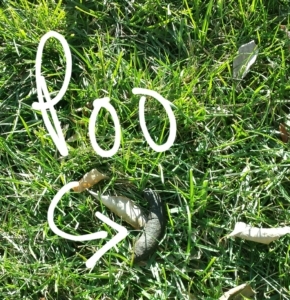 On several occasions, Gus and I have discovered fox feces in the yard and on the private road and trails behind us. We got to see the stunning red creature only once. 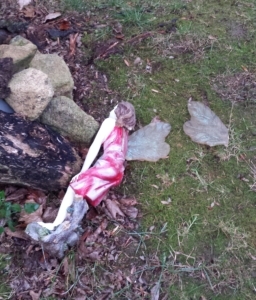 Whether it’s a fox or, as we suspect, a kitsune leaving dumps in the yard, it’s worth adding to the suspect list. Foxes love chickens. Meg von Fae is about the same size as a chicken and has attractive red and white coloring. 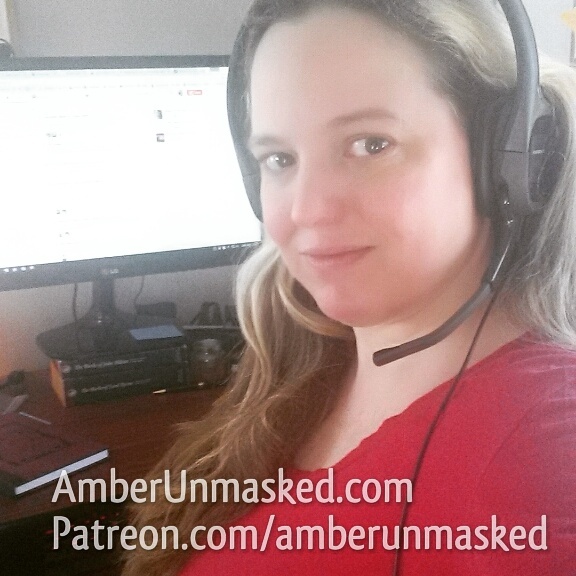 It’s possible Meg was the victim of kitsune attack because of mistaken identity. The fairies have a bit of a clique anthropology structure, sort of like sororities and frats only all-gender. The woodland fairies are edgier than garden fairies. Everyone thinks the Goth fairies are oh-so-scary, but they’re really just into poetry and reading so they keep to themselves. Those woodland fairies though, they are badasses with all kinds of knowledge about practical munitions and scavenging. If a woodland fairy thought there was justification in an vicious assault like this, they would not fail. Veronese Anne Stokes `Spirit Guide` Angel Statue 9 1/2 in.